We have had SO many positive changes this month! We were able to start wearing clothes, We moved out of the isolette and into a crib, we hit 4 AND 5 pounds and we were able to take off oxygen!! I am so thankful! I get into a routine and am forgetful that she is in a hospital and still fragile. Yesterday she required oxygen during and right after a feed to bring her numbers back up. 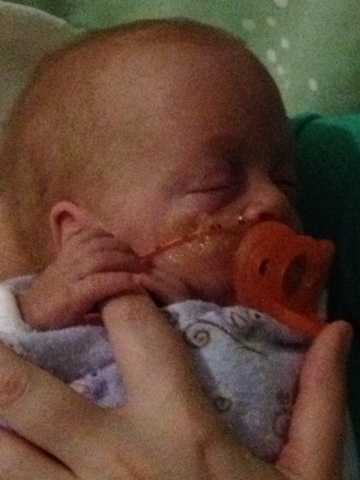 To me, 5 pounds sounds humongous and I get all excited thinking she is going home soon. I forget that she isn't even 16" long yet. That she still holds her breath and forgets to breath. All of her wrinkles from being a "newborn" are gone. She is strong. She can move her head side to side looking around. She can do a sort of push up. She wiggles around in her crib. But she still shouldn't be born for 5 more weeks. Over a month of developing in the womb still. So even though I look at her and see an (almost) 3 month old baby, I have to remember how young she really is. I know she will get all of this breathing and bottles down one day and never look back. The doctor came in and said that is it outrageous that Briella is doing as well as she is being that she is a "23 Weeker". It is great to hear the reminder from a doctor. I get so used to Briella exceeding expectations that I forget what should be her normal. Today I am very proud of Briella. They raised her feedings to 48mls. She took all of it in a bottle for me at 3! And at noon she was wide awake and exchanging silly faces with Dad for about half an hour. Now that Briella is in a crib she can have baths and not just a sponge bath!! Last night was my first bath with her. It was her 3rd. We weighed her on the scale, she was squirming around naked. I was supposed to pick her up then the nurse would set the bathtub down on the scale and I was to place her in the tub. Well as soon as I picked her up she turned bright red and held her breath. I said loud "there's something wrong with her!!" And the nurse said yes, she's angry! Ha! She got so mad she made little fists and then screamed! Then I put her in the water and she was ok for a split second when she felt the warm water. And then the crying started. The nurse scrubbed her clean while I tried to calm her. 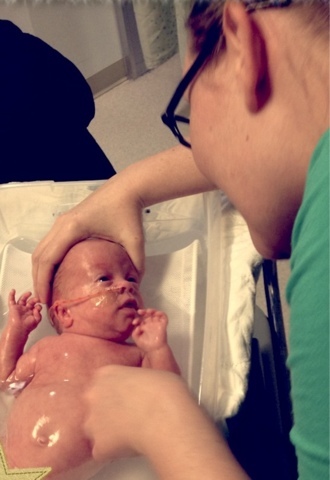 I didn't know how great it would feel to just simply bathe my child. But after 11 weeks, I was able to smell the great scent of my clean baby. Snuggle with her after she got into her pajamas. And smile at her fluffy hair. Ahhh. I slept well. We now have a Facebook page for Briella's Journey! There we will post daily smaller updates that wouldn't be big enough for a whole blog update :) And daily pictures.